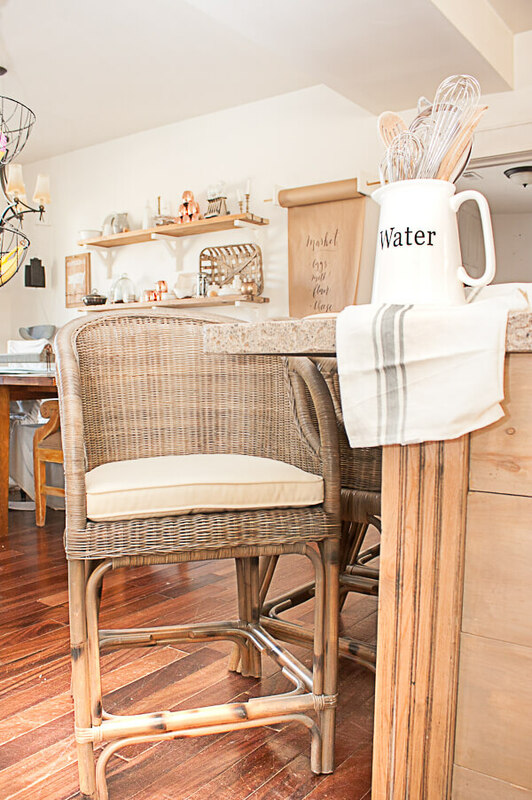 I was looking for new counter height stools or counter height chairs for my kitchen island. 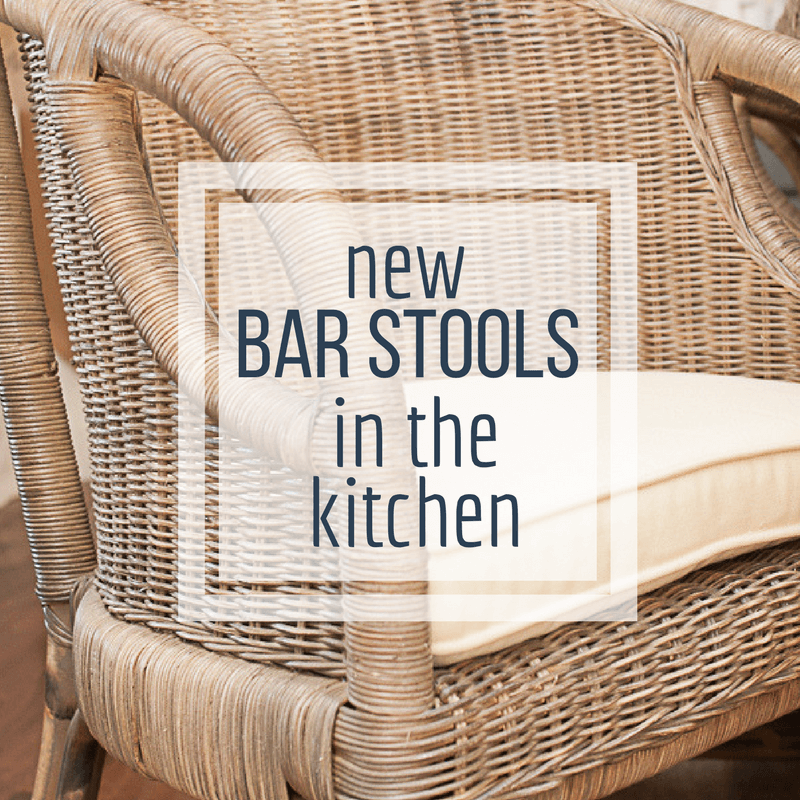 Choosing bar stools for your kitchen island can be difficult! Come see what I took into consideration before picking the right ones for my space! Over 10 years ago when we built our house, I bought the cutest black counter height bar stools for my kitchen island. They were adorable! They had that cute X back that is still a pretty popular design. I really loved them. But…….as with anything, you never know what you are going to get, for sure. We have 4 kids. And with 4 kids, you also get a lot of use on furniture and house hold items. That is where our bar stools come in. Our kitchen island was the busiest place in our home. All the kids ate around the island, since it was more fun to sit here than at the dining table. And our bar stools, they felt it. Now, I will say my kids are pretty respectful of furniture and other items in our home, but these bar stools just could not hold up. They were made of soft wood, and within a few years, every rung on the bottom of the chairs had been broken at least once. I fondly(or not so fondly) remember my mom yelling “this is why I can’t have nice things!” when we would break or damage something. And its true! It is so hard to have nice things. But it’s still nice to have them. Having a handy husband meant that he was really great about trying to fix them. If you looked really close you could see wood glue, and screws in the wood. Even with that, they just kept breaking, and we were so dismayed. We spent good money on these and they just seemed to be a fail. But, we persevered and made them work. The legs would get loose and the seat would wiggle, but we kept fixing them, because in the end, we just didn’t have the money to replace them. Also, I didn’t want to buy new counter height stools until my kids were a bit older and would not be crawling all over them. 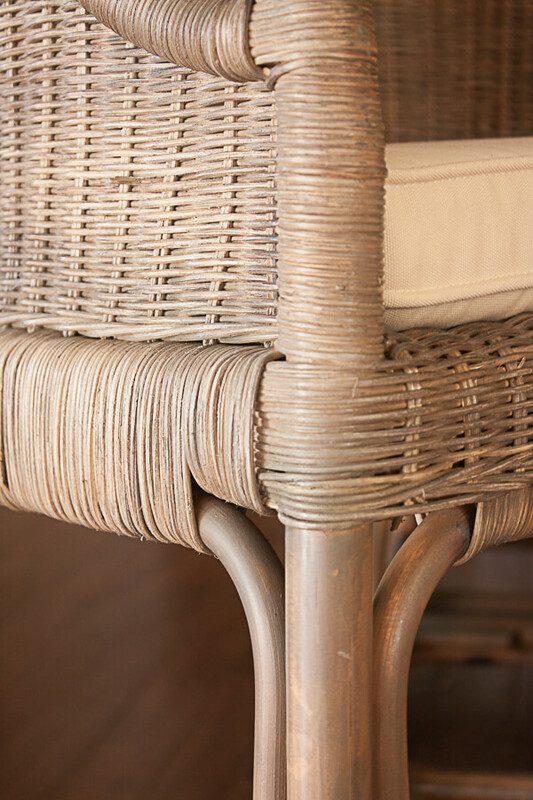 The last straw for our chairs had to be when we could not fix the bottom rungs any more and I found my husband using “funny pipe” also know as flexible black sprinkler pipe, to look like the rungs. It was so odd to see my kids step on the rung and have it flex and sway. It was quite innovative though! 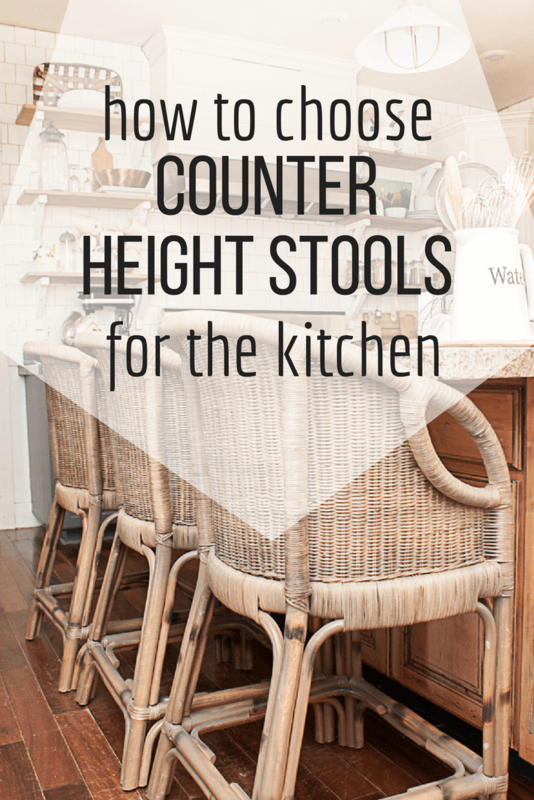 Choosing counter height stools and chairs can be difficult. First, there are a lot of options. Second, they are hard to find since they are often mixed in with regular bar stools on websites. 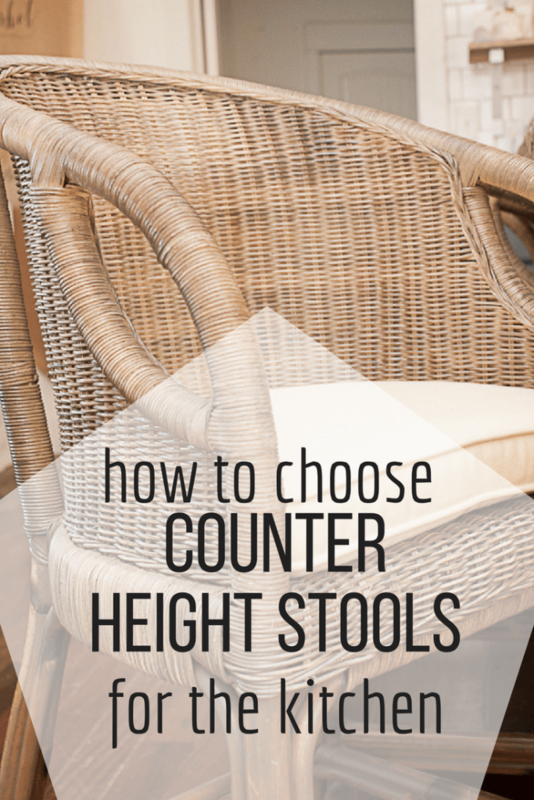 Luckily, I had a great source for where to find stylish counter height stools and chairs. But wait. Let me tell you something. I have a problem. I am super weird about what I choose, and I am not a fan of picking the same thing that everyone else has. I also am not a fan of so many styles of bar stools and chairs. They can get so weird. But, every time I hopped over to The World Market website, I drooled over so many of their selection of bar stool and chairs. The only problem I found was that the ones I loved were completely upholstered pieces. This made me incredibly nervous. Kids plus upholstery is always a nightmare in our house. 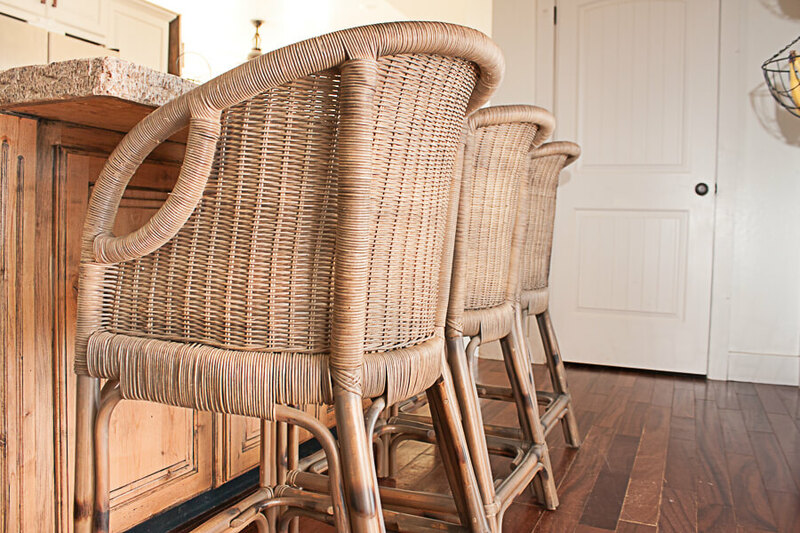 Then I came across these amazing Rattan counter height chairs. I was obsessed! I went to order them, and they were on back order. I checked back about once a month and finally last month they came back in stock! I was so thrilled! They were also on sale! Holla! I wasted no time ordering the Grey Rattan Adrie Counter Stools. And they arrived so quick I could barely believe it! I loved everything about these chairs. The color, the texture, and the small cream cushion on them. But, that small cream cushion made me nervous. And I went about fixing that problem. I will tell you more about that later this week, but let me tell you….Game Changer. So, now they are here, in our kitchen and I have a small love affair going on right now. They look so amazing with my bleached kitchen island. 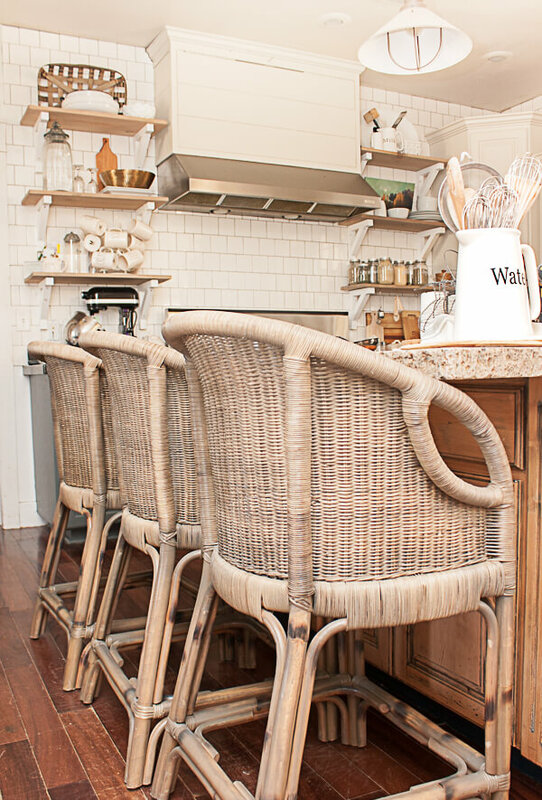 Their lower rounded back is perfect and the grayish color of the rattan is perfect for my kitchen. And guess what, they have dining chairs too! I may be investing in some of those in the near future! I love my counter height stools. Well, I guess I should call them chairs. Terminology seems to be loose in reference to chairs and bar stools. Call them whatever you want. I call them beautiful. I feel quite spoiled! It always makes me feel like a grown up when I make purchases like this and I feel very fortunate to be able to! What do you think of my new counter height stools? Are you a fan? Well, even if you aren’t, I sure am! What is the general style of your space? Farmhouse, industrial, modern, rustic, or traditional? You can definitely mix styles, but you need to choose wisely. Take inventory of the finishes in your space. If you have a lot of wood, maybe look for something painted or metal to break up the materials and finishes. 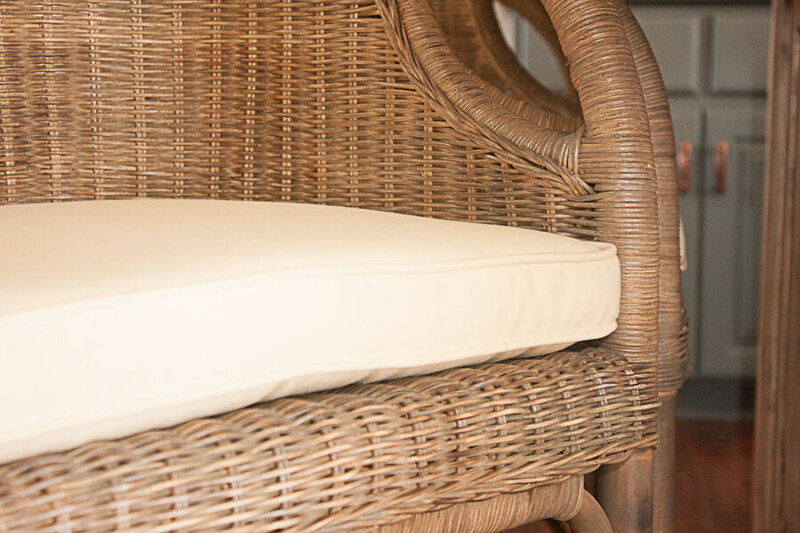 Think about kid friendly- do you need something more durable that can withstand young kids? Do you want chairs with a back, low back, or no back? Say you have an all white kitchen. You could go many ways. You could keep a very serene look by adding white, or light colored bar stools. 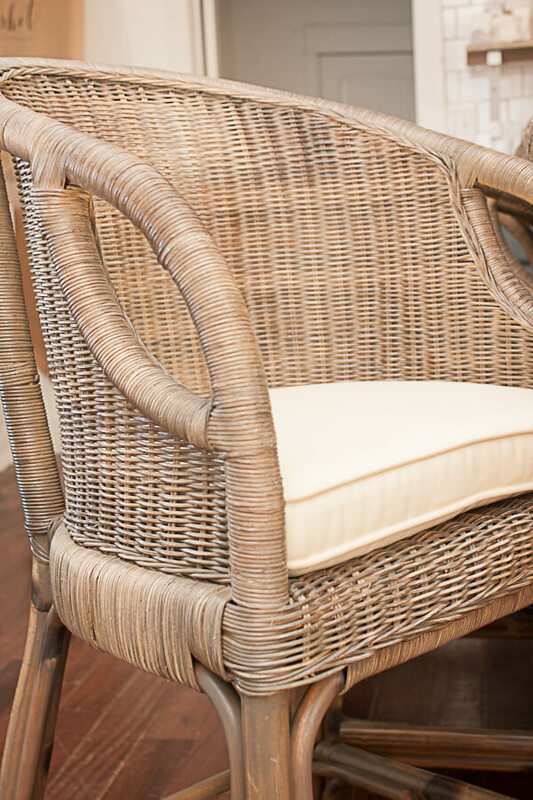 You could also break up the white, and add some interest by adding rattan, or metal chairs. 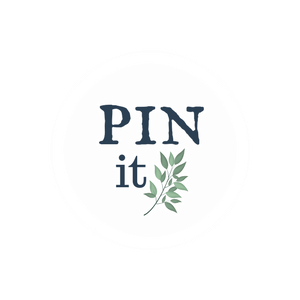 Take a cue from the colors of your cabinets and counter tops and even your light fixtures. It is easy to get stuck down a rabbit hole of decision. And at the end of the day, pick something you love! Even if it is not everyone else’s favorite. You cannot please everyone, so why not please yourself. Make sure to check back and see how I have figured out how to protect them and keep them safe from kids messes! If you like this, please save it or share it with others. This is how us bloggers keep out websites going. We depend on you! And we appreciate you! Thanks so much for stopping by! Make sure to check out these other posts if you want to see more of what I have done in my home. « The Ultimate Craft Supply Giveaway!